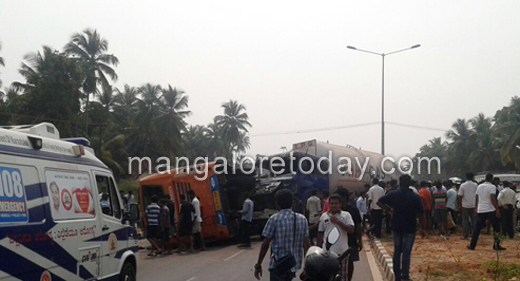 Udupi, Oct 31, 2016 : Over 30 bus passengers were injured, some of them critically when a private express bus which was heading towards Udupi from Mangaluru was hit by a gas tanker from behind on the National Highway 66 at Kinnimulki on October 31, Monday. The bus has overturned due to the impact of the collision. An overtaking attempt by the driver of the gas tanker is learnt to have led to the mishap. The tanker driver has been taken into custody. The injured have been admitted to the KMC Hospital at Manipal. Udupi Traffic Police have registered a case. More details awaited. The tanker accidents are increasing. So many ate injured because of on persons mistake.